And despite affecting 1 out of 200 adults over the age of 65 in the United States, general awareness of IPF is low. "There's a tremendous disconnect between the human impact of this disease and its recognition by the public. Few people have ever heard of it," says Marc Peters-Golden, M.D., a professor of internal medicine in the Division of Pulmonary and Critical Care Medicine at Michigan Medicine. "By the time most patients with IPF finally see a pulmonologist, their disease is already fairly advanced." Fibrosis, or scarring, can occur in every organ of the body. But the lungs are delicate and must inflate with every breath. If scarred, they become stiff and make breathing extremely difficult, Peters-Golden says. The disease, which for many has a life expectancy of three to five years, often leads to respiratory failure. Even worse, the cause of scarring in IPF remains a mystery. It's why Peters-Golden, research investigator L. Raghu Penke, Ph.D., and team sought to find out whether blocking a problematic gene known as FOXM1 could stop or slow the development of fibroblasts—highly activated cells that contribute to scar tissue production in fibrotic lung disease. Published in the Journal of Clinical Investigation, the Michigan Medicine study breaks new ground: "The role of FOXM1 within lung fibroblasts in pulmonary fibrosis had never before been investigated," Peters-Golden says. "We proved that, in principle, if we block FOXM1, we can reduce the activation of fibroblasts as well as the process of fibrosis itself." In normal lung tissue, few fibroblasts are present. However, in IPF patients, those fibroblasts proliferate and expand, similar to the way cancer cells do in a tumor. This analogy led Peters-Golden and his team to look for potential clues in the arena of cancer research to explain these rogue fibroblasts. Prior research has shown that FOXM1 promotes cancer cell growth; drugs to block it have been under development. The study, which examined lung fibroblasts from patients with IPF and mice (the rodents' lung fibrosis was triggered by a toxic drug), found that both groups had increased levels of FOXM1. "After we engineered the mice to eliminate the FOXM1 gene from the fibrotic fibroblasts, we administered the toxic drug that causes fibrosis," Peters-Golden says. The result: "The mice were substantially protected," he says. "This showed us that FOXM1 in fibroblasts was important for the process of fibrosis." Next, the team used a drug treatment approach. They took unaffected mice and gave them siomycin, an experimental compound designed to block FOXM1, and they saw that the drug prevented fibrosis in vivo. "When we blocked FOXM1 with either the drug or the genetic approach, we reduced the accumulation of fibroblasts and decreased production of scar proteins, indicating to us that the excessive FOXM1 seemed to contribute to the bad behavior of the fibroblasts," Peters-Golden says. Three years ago, the FDA approved the first drugs for IPF. While these medications slow progression of the disease, they don't reverse the fibrosis that has already developed. "Although having some treatment options for IPF is no doubt an advance, in my view, these drugs are like a bunt single, rather than the home run we all want," Peters-Golden says. Peters-Golden points out that siomycin isn't approved for use in humans, but scientists are working on better drugs to block the overactivity of FOXM1 in cancer cells. 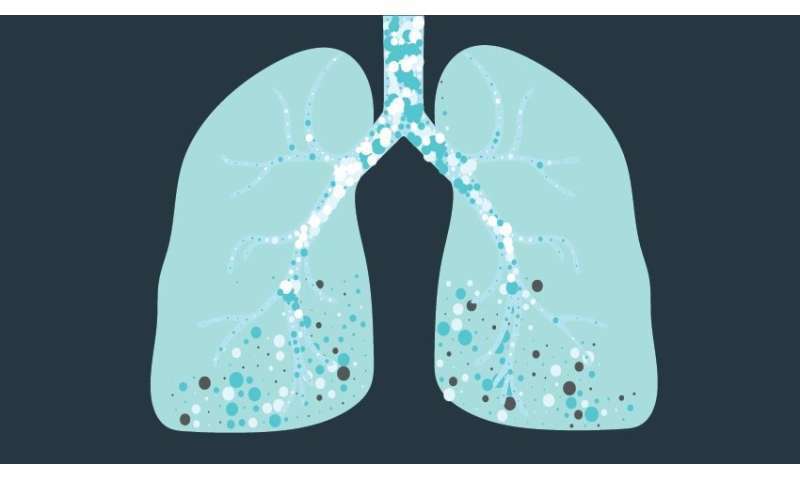 When those drugs have been demonstrated to be safe in humans, they could one day be tested in clinical trials for IPF and perhaps other scarring diseases of the lung and different organs. There is still much to learn about how FOXM1 affects fibroblasts and how pulmonary fibrosis can be reversed, Peters-Golden says. In upcoming research, his team will see how inhibiting or deleting FOXM1 affects mice with a more advanced degree of fibrosis.